LONDON, 7 October 2011 - LoveTheGarden.com will give a £200 restaurant voucher to the blogger who comes up with the most ravishing recipe based on fresh tomatoes. To be in a chance to win this appetizing prize or one of three cookbooks by James Ramsden, people must write a blog post about the Taste for Tomatoes competition including their most cherished tomato recipe and email the URL of the post to entries@lovethegarden.com before 19th October 2011. The judge will be James Ramsden, author of the cookbook Small Adventures in Cooking and the popular food blog www.JamesRamsden.com. He will especially be looking for surprising recipes that bring out the unique flavour of fresh tomatoes. Fresh tomatoes are extremely versatile – they can be used in salads, salsas, soups, sandwiches and many other dishes. 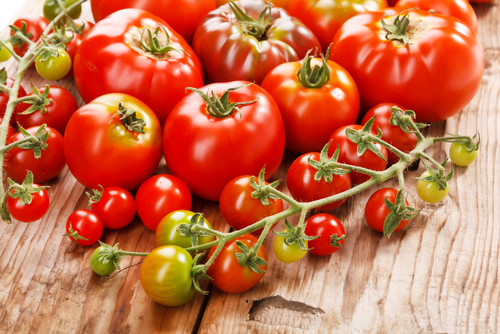 Bloggers are allowed to include all tomato varieties in their recipes, from big beef tomatoes to sweet cherry toms and from the Yellow Roma to the Russian Black. Each type of tomato has its own unique flavour and texture and the aim of the competition is to find a recipe that brings out the best in the tomato of your choice. The Taste for Tomatoes competition is LoveTheGarden’s third culinary contest this year. They are organizing these competitions in order to make vegetables more popular in the British Kitchen. The Creative with Cabbage competition was won by blogger Karolina with her Cabbage & Mushroom Pasties. David Hall won the Potty for Potatoes competition with his Hot potato, bacon and nasturtium salad. For more details and terms and conditions of entry, visit the vegetable garden competition page at LoveTheGarden.com. LovetheGarden ®, ™ and Miracle-Gro, Plus, Scotts and Pour & Feed are trademarks of The Scotts Miracle-Gro Company LLC or its affiliates. This press release was distributed by ResponseSource Press Release Wire on behalf of Arena Quantum in the following categories: Leisure & Hobbies, Home & Garden, Food & Drink, for more information visit https://pressreleasewire.responsesource.com/about.